Bowls made from recycled metals and seating inspired by traditional Arabic Majlis featured in an exhibition of emerging talent from the Middle East and North African regions at this year's Dubai Design Week. Middle East: Design Now! is a travelling showcase curated by author and furniture designer Suzanne Trocmé. It aims to provide a global platform for design from across the Middle East and North Africa (MENA) region. "There are many preconceptions about contemporary design in the MENA region where talent is incredible and comes from quite different disciplines and experiences," Trocmé told Dezeen. "Design education itself is sketchy in countries such as Kuwait so students tend to travel abroad to study." "With a newfound interest in seeing what designer are creating in the region via such showcases as Middle East: Design Now! we are changing the game," she continued. "The bigger picture is to encourage industry and to make an economically viable infrastructure – the business of design. It should be happening everywhere in the world really," added Trocmé. The exhibition opened during this year's Dubai Design Week, and is on show at the Dubai Design District until 9 December 2017 – following its debut at this year's London Design Festival as part of Designjunction. Having grown in size with the addition of new, specially commissioned pieces, the latest edition of the showcase includes 38 different product designs from designers across the region including the UAE, Saudi Arabia, Kuwait, Lebanon, Jordan, Egypt, Tunisia and Morocco. "We have exposed 50 or so designs thus far," Trocmé told Dezeen. "Many pieces are designed and nurtured specifically for us. Part of the program is to work with the designers refining the designs as a kind of incubation project." The featured designers are united by their use of traditional methods, materials or motifs that have been reinterpreted for a modern day context. Works include a presentation of stylised Arabic tattoo designs presented in frames by Jordanian artist Hayan Maani, who has a long-standing interest in Arabic calligraphy. The chubby Boussa armchair by Moroccan designer Younes Duret borrows its form from the wide mdamma belts that are used to define the waist when wearing traditional Moroccan kaftans – a feature echoed in its base where the upholstery appears to bulge out from the frame. A series of tapestries by Lebanese brand Bokja are made by stitching old Aubusson remnants to garbage truck tarpaulin which is then embroidered. Trocmé, who has been working with designers from across the region for the past four years, found some of the designers on social media and through word of mouth. "Working throughout the region for the past four years has exposed to me a whole new world of creativity which comes from a different sensibility. Each piece in this showcase has a story," she said. "One interesting observation is how many more women there are in design than on other continents," she noted. 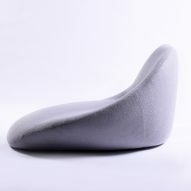 "Alia Al Mazrooei from the UAE created the most contemporary seating specifically for the exhibition. I hope she will become quite a poster girl for the region." Al Mazrooei's Benad floor seating is inspired by traditional seating in Arabic Majlis – a room in the home where guests are entertained and seating takes the form of cushions placed on the floor. 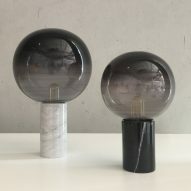 Other female designers include Salsabeel Amin from Egypt, whose Ore lights are made using three of the most fundamental forms of craftsmanship in Egypt - brass marble and blown glass. Kawther Alsaffar from Kuwait, described by Trocmé as a "great thinker and innovator", presented a set of Dual bowls which were created in collaboration with local sand casters. "Their work is quite flawed so Kawther took the flaws and augmented to create her extraordinary pieces. Since I first showed her pieces in September, she went onto Kickstarter and has sold over 600 pieces." Kuwaiti contemporary textile artist Manal Al Maimouni contributed the Sadu bench. Its name derives from Al Sadu – a form of embroidery hand-woven by Bedouin people that features geometrical shapes. As a member of the Al Sadu Society in Kuwait, Al Maimouni felt a need to incorporate cultural relevance to her work. 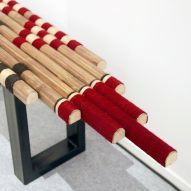 Using natural materials like wool, cotton, silk and jute, the bench design combines her unique weaving techniques with wooden elements. 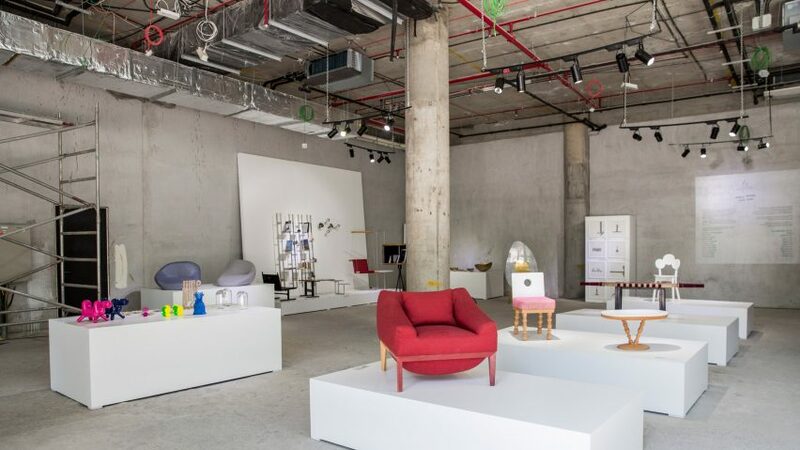 Dubai Design Week took place from 13 to 18 November 2017, with the aim to strengthen Dubai's position as a global hub for the design and creative industries. Now in its third edition, the week involved over 550 designers who exhibited work at 200 events across the city.